The FuseIT SFDC Explorer has been extended to provide Code Coverage reports for Apex classes. Then, in the Winter 14 release they stripped this functionality out and proposed using the Developer Console instead. We are slowly moving all functionality in the various setup pages into the Developer Console. Starting with the Winter '14 release, you will be able to see your code coverage metrics, at a glance, in the Developer Console tool only. This information will no longer be available in the class and trigger list views as it has been in the past. Moving forward, the Developer Console will be the supported tool for browser-based development on the platform. It is costly to support multiple tools that perform the same function, so we are migrating everything to a single application. Over the next few releases, we will be retiring the old setup pages entirely. You can still check the code coverage using the developer console, but I find this doesn't work well with my development. Finding the correct class and refreshing test results is ackward. Maybe it's just me and I'm missing some shortcuts with the Developer Console. Happily, the Tooling API can now pull most of the required data for code coverage. So, rather than complain about lost functionality, I've started to build my own tool. The Code Coverage tab in the SFDC Explorer is fairly minimal at this stage. 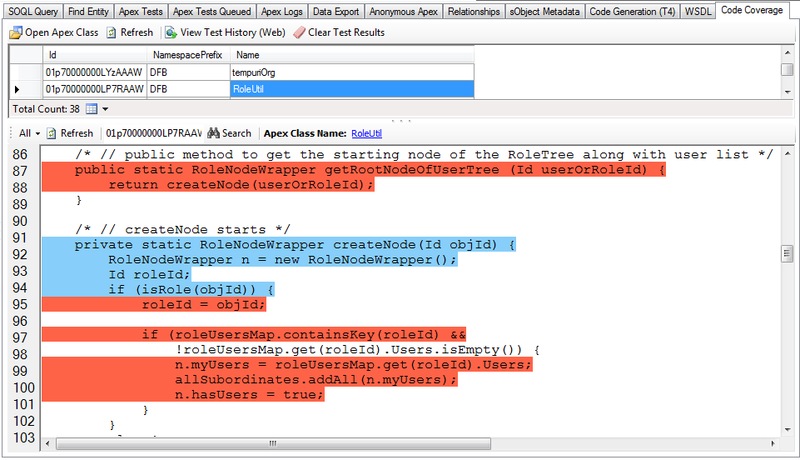 You can search your Apex classes and then open up a code coverage view. The code coverage results here rely on the results of running asynchronous test cases. You won't see any results from the synchronous test runs. Given an Apex Class name or Salesforce Id (01p key prefix) you can quickly search for the code coverage results. There are buttons to link to the Test History in the Salesforce Web UI or clear the current code coverage results. This is cool Daniel! Can you do a Mac version? It's all .NET based at the moment. Maybe I could do a port via Mono. I don't have access to any Mac hardware to test it on. I'll ask around at work to see if anyone is interested in porting it.